World Futures Studies Federation (WFSF) is a UNESCO and UN consultative partner and global NGO with members in over 60 countries. The WFSF brings together academics, researchers, practitioners, students and futures-focused institutions. It offers a forum for stimulation, exploration and exchange of ideas, visions, and plans for alternative futures, through long-term, big-picture thinking and radical change. WFSF website. Each year, the FFRC organises its annual conference, an invaluable opportunity for meeting, exchanging and debating current topics related in futures studies and foresight. With approximately 100–200 individual participants attending from all over the world, international researchers, organisational delegates, business people and students convene to the FFRC annual conferences in the spirit of futures-oriented information, research, analysis and collaboration. Conferences are held in the three Finnish cities where the FFRC units are located: Turku, Tampere and Helsinki. The activities of the annual conference include keynote speeches and panels in plenary sessions as well as papers presented in parallel sessions. Researchers are invited to submit papers for presentation at the annual conferences. 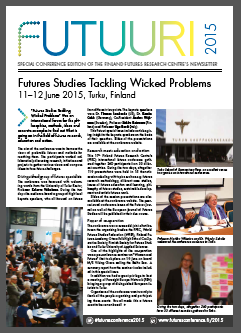 It is hoped that papers presented represent a broad spectrum of futures studies and current topic related each year.